Bomber Crew is a strategic bomber game where you micromanage the crew of a Lancaster-Bomber during WWII. It is one of those games with no real story where the challenge comes from keeping your plane in the air without dying to much, and then do it over and over again. If I would make a comparison it would be FTL (Faster than Light) and Sunless Sea. Considering FTL is one of my favourite games of all time and a game I still play from time to time I had great hopes for Bomber Crew. Did it live up to the hype? Well, almost. Bomber Crew is out now on the Nintendo Switch, PC (Windows, Mac, Linux), Xbox One and PS4 and we tested it on both a Xbox One X and a PC. The main bulk of the review was done on a Alienware R5 laptop with a generation 8 Core i5 and a GTX1060 videocard. This is not a resource-heavy game and we had no issues playing it at 4K on the laptop at 50-60 fps. After the game is installed there is not much configuration that can be done before start. 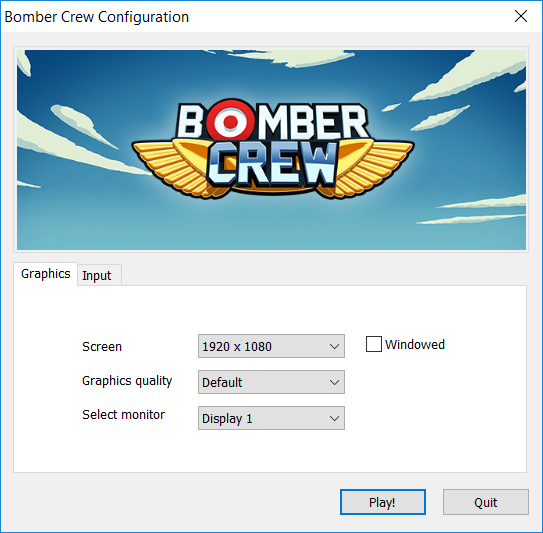 The quality settings are “Default” and “Low” and you can select the resolution of your screen as well if you want to run the game in windowed mode or not. We tested the game on a external 4K-display and it was easy to select which monitor the game should start on. If you start the game new you will get the chance to run through a tutorial to learn the controls. if you however start the game after a few sessions (and deaths) you will be met by some of the fallen heroes in your game. Yes, I will never forget Sgt Delbert Hill, Virgil Trimming and Max Murphy. Actually, I already have forgotten them. Because this is a game where you should do everything to keep your crew alive but where you quickly will learn that there is no use to get to attached to the crew-members as they ultimately all will be replaced during the game. The airfield is where you select everything you want to do. It also shows some statistics. In this case quite early during my play-through I had already lost 2 bombers and 7 aircrew during 14 missions. As mentioned in the beginning it is not recommended to get to cozy with your crew as you will loose most of them. You need a pilot, navigator, bomber and a bunch of gunners. If a crew-member dies you can choose from a bunch of new ones. While they start at a low level in the beginning of the game, as the game progresses new members will have higher starting levels meaning that even if your super-leveled-up crew-member dies you won’t have to start from level 1 for his/hers replacement. This also means you have even less reason to care for your crew as it will be replaced with relatively similar people. You can buy gear for your crew-members and as you earn more experience points and gold more options are opened up. You can either buy full “sets” which includes various items or update a certain item, for example the helmet, separately. If you want to help your crew-members to survive it is important to keep upgrading their equipment. For example, in the beginning you might only have basic flight suits that are not suited for high altitude flying and thus you will be restricted how long you can stay high before they start freezing and die. 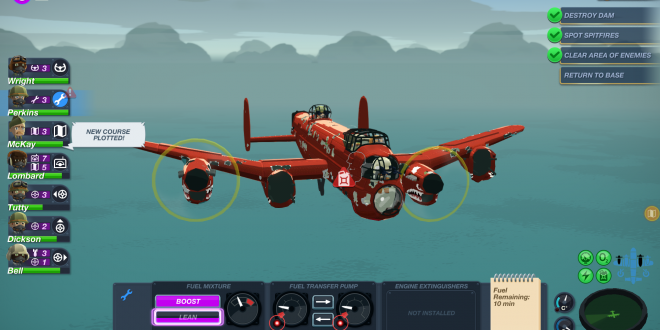 Ahh, the mighty Avro Lancaster. One of the most iconic bombers during WW2. 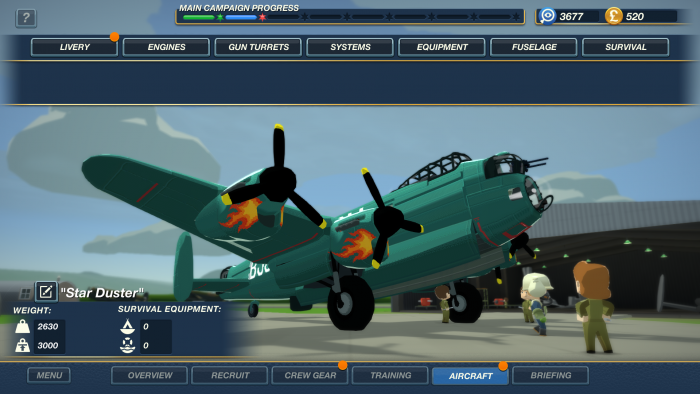 This is the plane you are flying in Bomber Command. Remember though – this is not a simulator so the plane can be equipped with a lot of weird stuff including rocket launchers. You can of course also paint it as you please. I think the Germans would have left this plane alone just from sheer confusion. As far as I can see the paint work does not affect how visible your plane is so feel free to channel your inner Freddy Mercury. 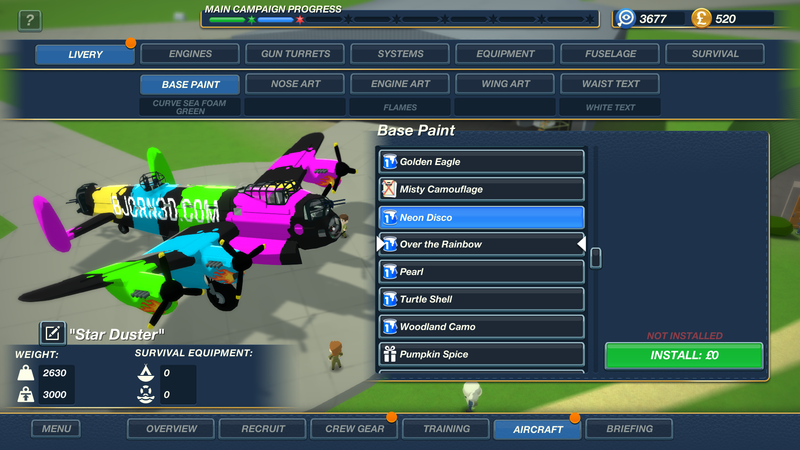 As you progress through the game you earn money and experience points and this means you can upgrade the plane with cool new stuff, both for defence and offence. 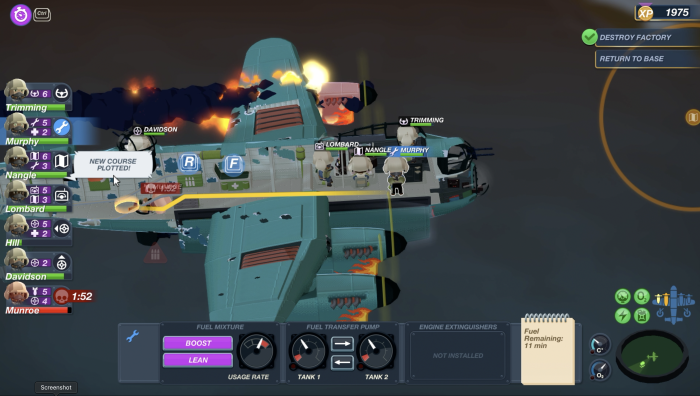 When a plane is destroyed you get a new one and while some add-ons are gone others will be transfered to the new plane. I’ve recorded a .video of a whole missions so that you can see how the game plays but here is a short text version first to give you the basics. 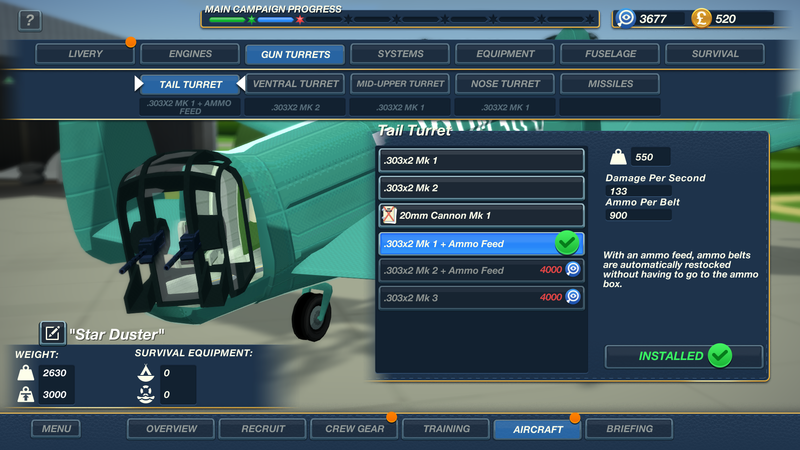 Each mission starts with a briefing where you can select from a number of different available missions. For each mission you get to know the difficulty as well as how much you will earn from the mission. If you bought the add-on Secret Weapons you can also select those missions but the game tells you if it feels the difficulty is too high for your level. You are the “god” in this game so you will have to make sure that all the crew perform the correct actions. To takeoff you select the pilot and click a button to takeoff. When the plane then is in the air you must raise the gear and then focus on the navigation icon that appears in the sky so that the plane locks into the new course. Each crew member has their role in the game but the role is actually determined by the station where they sit. So you can send a gunner to the pilots seat and stear the plane (albeit not as well) and so on. Use pilot to take-off and focus on the next waypoint. The pilot also handles which altitude you want to be at. As you fly your navigator will pick out the next waypoint. This can be seen by selecting the navigator and follow a circle being filled. When it is filled the next waypoint appears. As you come closer to a target enemy planes appear. Now you must focus on them to “target” them. If you forget to do that your gunners won’t fire. As you close in to the target you move your front gunner to the bomber seat, opens the bomb bay-doors, select the number of bombs to drop and, when the time is right drop the bombs. During the mission alternate targets appear that you can either attack or take photos of (works like bombing). I’ve used the word “focus” a lot and this is an important game mechanic that you need to learn. It is quite simple, by using a button (depending on the plattform) your view zooms in and “focuses” on a narrower area. Everything inside this area is targeted after a short while. While it feels ok when it comes to navigation it is not as intuitive for the gunners. In the heat of the battle it is easy to forget to focus on a flight of enemy planes and thus not shoot at them. 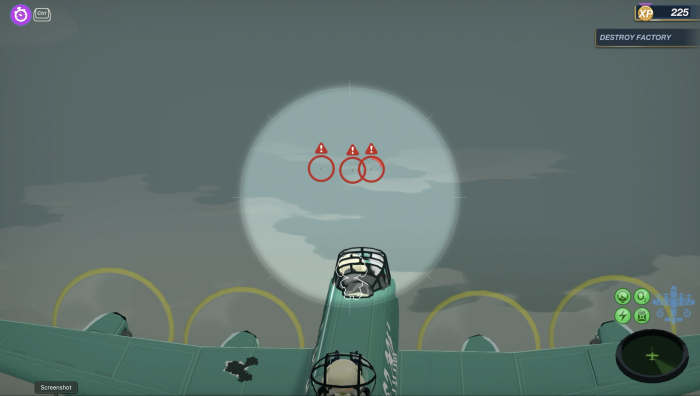 Any planes that are “un-targeted” are shown as green circles while targeted planes are shown as red circles so you will realize that there are un-targeted planes out there but still, I think this could have been handled better. 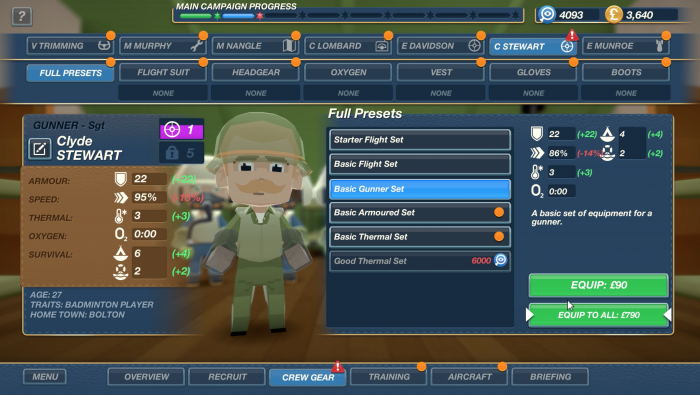 Inside the plane you select a crew-member and then click where you want him/her to go. It is unfortunately a bit too easy to miss-click in my opinion so sometimes it is easier to click on the name in the list instead. Still, in the heat of the battle (and as you see in this screenshot from the video things are not looking good) it is easy to send a crew-member to the wrong spot and for example instead of getting him to heal the dying guy have in stand beside him twiddling his thumbs. 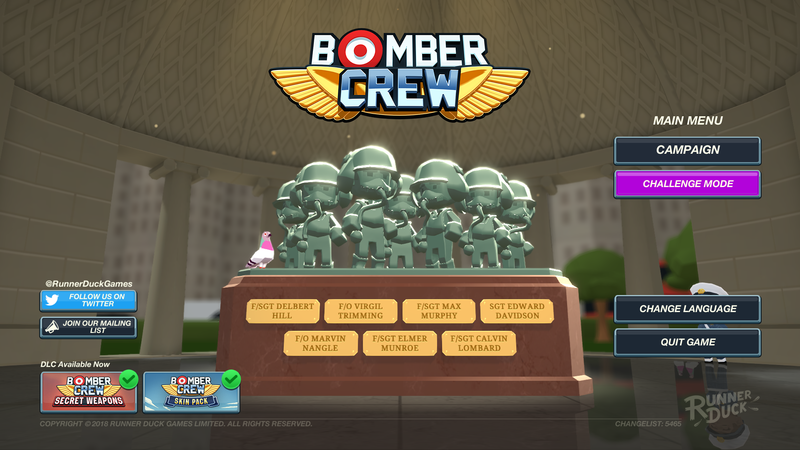 As this is a game you can send your crew-members everywhere on the plane, including the wings. This is needed if you want to repair a burning engine or a busted wing. Summary – is it fun? So, is this a fun game? To me the answer is yes, most of the time. As I mentioned in the beginning of this review I love games like FTL and Sunless Sea so I am fully on board with this types of games where you are expected to die and start over. I also think the game play overall is fun and engaging even if it is a bit repetitive. 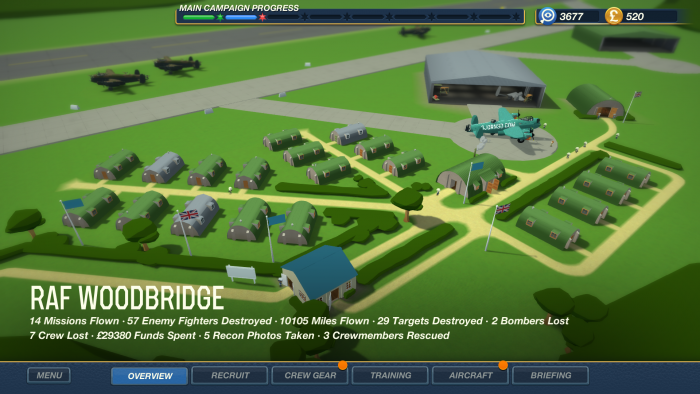 There are a limited number of types of missions so you will bomb stuff, photograph stuff and shoot stuff down (trying to hit a V2-rocket with the gunners from a Lancaster is …. interesting). My main point of complaint would be the controls that are a bit fiddly and not always precise enough in the heat of the battle. True, I could turn down the speed all the time but what is the fun with that (you also get bonus points for not turning down the speed during a mission)? I also found the game a bit harder to play on the Xbox One X compared to on a PC with mouse and keyboard. 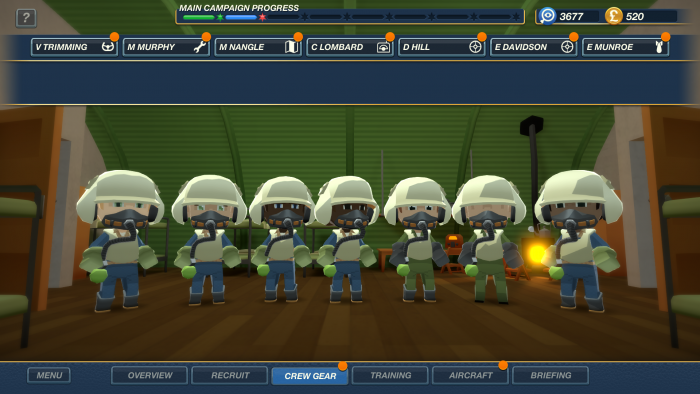 Trying to control your crew with the controller is even more in-precise than on the PC (Update: I have not yet tried it with the newly released keyboard/mouse-support on the Xbox One but that should help). The Switch version should in that regard work better. If anything this is a game I would love on a tablet. Previous Gigabyte Z390 AORUS Pro WiFi: Is Midrange AORUS Right For Your Next Build? 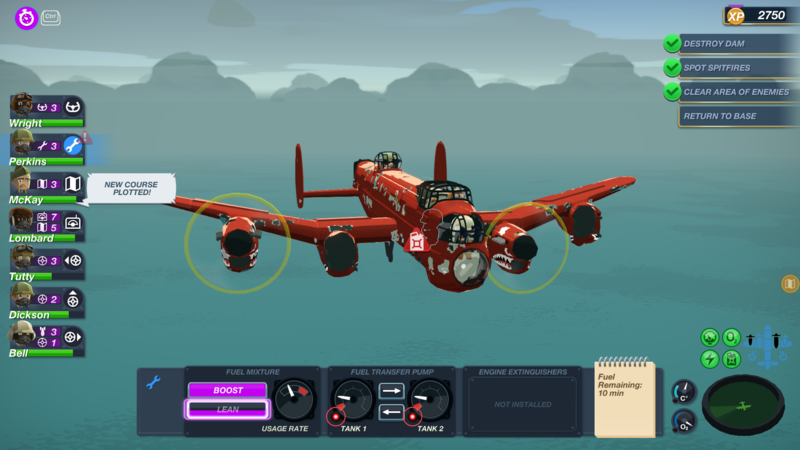 Bomber Crew lets you micron-manage the crew of a Avro Lancaster, a task that is both fun and challenging.